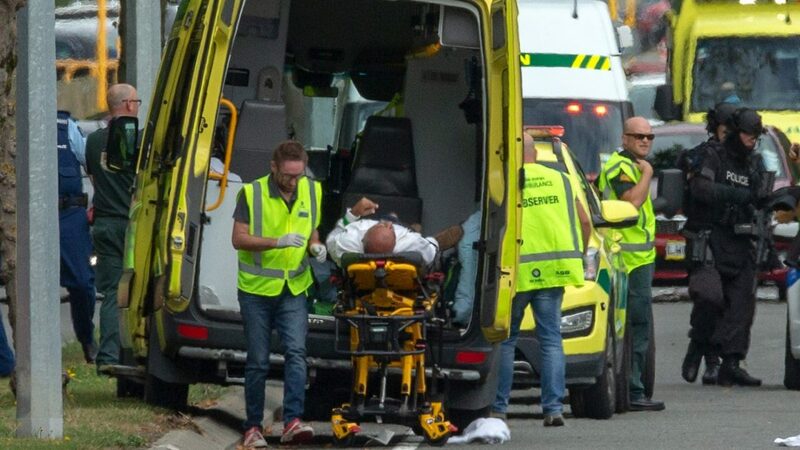 A gunman who killed 49 people in a terror attack on two mosques in Christchurch in New Zealand is believed to be an admirer of Balkan nationalists and historical figures, and he played a song honouring Radovan Karadzic before opening fire. A Facebook user with the name Brenton Tarrant – the man who reportedly killed dozens of people in a terror attack on two mosques in Christchurch on Friday morning – posted pictures of Balkan nationalist symbols online and a statement criticising US involvement in Kosovo. A video also showed that before the shooting, the gunman played a song honouring Bosnian Serb wartime political leader Radovan Karadzic, whose final verdict for genocide and war crimes is due to be delivered next week. I just noticed that song in car played by suspected gunman before #ChristchurchMosqueAttack is a Serbian nationalist song praising convicted Bosnian Serb war criminal Radovan Karadzic. Ahead of the killings, the user of the Brenton Tarrant account posted a 73-page ‘manifesto’ which said the motive for the attack was to “create fear”, and included anti-migrant hate speech, calls for killings of Muslims, and white supremacist rhetoric. The text also contained a section about the Kosovo conflict. “Balkanization will also reduce the USA’s ability to project power globally, and thereby ensure that never again can such a situation as the US involvement in Kosovo ever occur again (where US/NATO forces fought beside Muslims and slaughtered Christian Europeans attempting to remove there Islamic occupiers from Europe),” it said. NATO has been leading peacekeeping operations in Kosovo since June 1999 after its campaign of air strikes to end Serbia’s military campaign against ethnic Albanian rebels. Pictures showing weaponry used in the shooting were also marked with the name of Montenegrin military leader Marko Miljanov Popovic, who led his tribe in the fight against the Ottoman Empire. The weapons were also marked with the name of Bajo Pivljanin, a commander who also fought against the Ottoman Empire in Bosnia and Montenegro. He dedicates the attack also to ‘Luca Traini’: he is an italian man who opened fire on a group of migrants in Macerata in late 2018. Another name marked on the weaponry was Novak Vujosevic, who fought on the Montenegrin side in the Battle of Fundina against the Ottoman Empire’s forces. So far New Zealand police have arrested four people in connection with the terrorist attacks. New Zealand Prime Minister Jacinda Ardern called the shootings “New Zealand’s darkest day” and said in a statement on Friday morning that “many of the people affected by this act of extreme violence will be from our refugee and migrant communities”.